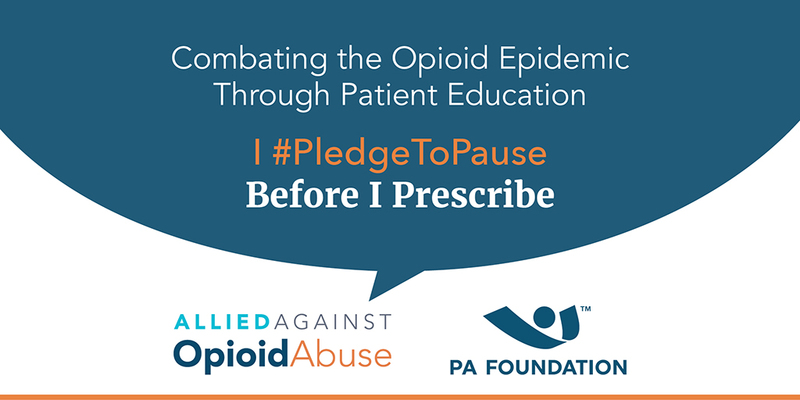 As a future PA and prescriber, I pledge to pause to talk to my patients and their caregivers about the treatment options available for pain, and risks associated with prescription opioids, as well as their responsibility to safely store and appropriately dispose of leftover medications. I will help combat the opioid epidemic by engaging my patients to make sure they understand their rights, risks and responsibilities associated with prescription opioids. Talk with your patients about addiction risks and ask about any personal or family history of addiction. Consider alternative treatment if there is a past history of addiction. Educate about partial fill at the pharmacy as a strategy to limit quantities on hand. Discuss what to do with leftover medication. Refer to the product packaging for disposal instructions. Provide information on local drug take back programs. Store all opioids in their original packaging and retain the prescription package information, directions for use and expiration date. Keep opioids out of reach of children and in a locked cabinet or lockbox away from family members and house guests. Remind patients who wear a fentanyl patch to cover it with adhesive film to make sure it does not fall off and regularly check to make sure it is still in place. Urge patients to monitor the medicine they take and how much remains after each dose so they know if there is any missing medicine. PA Foundation empowers PAs to improve health through philanthropy and service and is the charitable arm of the American Academy of PAs (AAPA). We are working together to engage and mobilize PA students to educate patients about their rights, risks and responsibilities associated with prescription opioids.